HoMedics USA of Commerce Township, Mich., is recalling about 3,000 MyBaby Giraffe Nightlights. This recall involves the HoMedics MyBaby Comfort Creatures Giraffe Portable & Bedside Nightlight, model MYB-N100GIR. The affected nightlights have the date code GP230118 or GP290318 and the date code is located on the underside of the product. 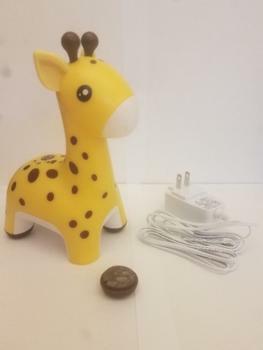 The recalled product, which can be powered by an AC adaptor or two AA batteries, is yellow with brown spots and white underbelly, about 3 inches long, 5 inches wide, 7 inches high, and weighs less than 1 pound. The nightlights, manufactured in China, were sold at Hinda Incentives, Power Sales, and online at Amazon.com and HoMedics.com from March 2018, through October 2018, for about $20. Consumers should immediately stop using the recalled nightlights and contact HoMedics for a full refund. Consumers may contact HoMedics at (800) 466-3342 from 8:30 a.m. to 7 p.m. (ET) Monday through Friday or online at www.homedics.com and click on the Product Recall tab for more information.